Red Auerbach was so beloved by people in the city of Boston, where he coached the Celtics, folks were willing to bend the rules just for him. When Auerbach's team would win a game, he'd light up a victory cigar afterwards. Signs on Boston restaurants often read "No Cigar or Pipe Smoking. Except for Red Auerbach." Auerbach earned the love and respect of fans and players not only because they shared in his success - he also shared his wisdom concerning both sports and life. He wrote seven books that conveyed his basketball genius and more. 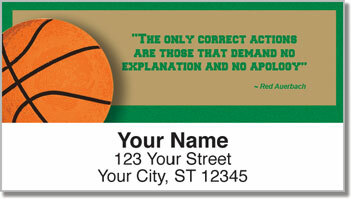 Now you can stick Red's words on your outgoing mail with these unique address labels. A self-adhesive backing lets you peel and place them on each envelope. 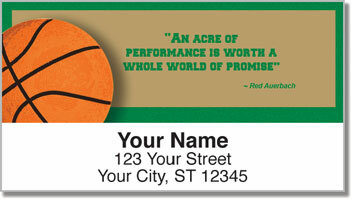 Get your own Red Auerbach Address Labels now! 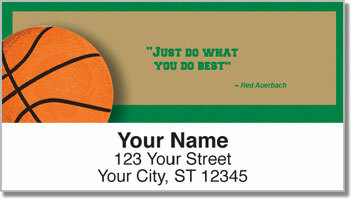 You can also order the matching check design.